Ariya Yoga is a style of yoga designed by Dominik Zaerin that draws on his training in Kundalini Yoga, Hatha Yoga, Qi Gong, and Energywork. Translated from Sanskrit ‘Ariya’ means pure and “Yoga” means union. Through a flowing and systematic combination of movement, posture, beathwork, meditation, chanting, and relaxation, held together with inspiring music and motivating commentary, you will quickly experience the true power and grace of Yoga. Ariya Yoga intends to bring you into direct contact with your latent life-force energy, experience a tangible elevation and purification of your body, mind, and spirit and feel deeply connected to your Self and the universe. After an Ariya Yoga session you will feel inspired, relaxed and strong – a sense that you are ‘back home’ inside your heart. Ariya Yoga is designed for everyone, regardless of age, background, fitness ability, experience in yoga or personal beliefs. Through his years as a Personal Trainer & Yoga Teacher Dominik believes the future of fitness is beyond and above what so many experience in a typical gym enviroment & his hope is to help ignite your inquisition! Dominik Zaerin studied under several renowned teachers in London, where he lived for many years. Dominik has worked as a Personal Trainer, Yoga Teacher, Energyworker, Massage Therapist, and Life Coach for over 10 years, with the aim of helping his clients feel better in a holistic way. He delivers private sessions, public classes and events, immersion programmes, and group retreats Internationally. Through his commitment, experience, and expertise Dominik’s clients experience a heightened sense of well-being, relaxation, & strength. 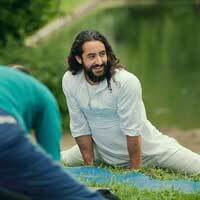 Dominik now lives in Austrian countryside and conducts workshops on occasion in London to offer his work and teachings to all those that seek him out.